Clos Saint Michel has been managed by its current owners, the Mousset family since the 1950’s. The original farmhouse on the property predates the family ownership by several decades. In addition, the Mousset family, headed by Frank Mousset and Olivier Mousset also own Domaine des Saumades. While the Mousset family has managed Clos Saint Michel for more than 6 decades, they have been active in the Southern Rhone as winemakers for longer than that. Olivier Mousset and Franck Mousset represent the 4th generation in their family to make and produce wine at Clos Saint Michel. Clos Saint Michel owns 14 hectares of vines in Chateauneuf du Pape as well as vineyards in Cotes du Rhone. 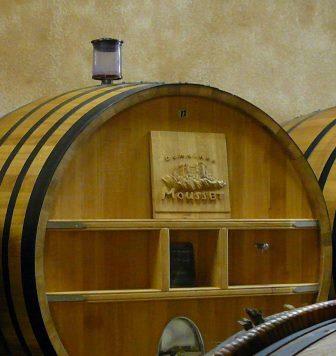 While the Chateauneuf du Pape wines are sold as Clos Saint Jean, the wines from the Cotes du Rhone are produced under the family name, Domaine Guy Mousset. Of the estates 14 hectares of vineyards in Chateauneuf du Pape, 12.6 hectares are used to produce red wine. The remaining 1.4 hectares are for the growing of white wine grapes. The best vintages of Clos Saint Michel are: 2018, 2017, 2016, 2015, 2012, 2010, 2009, 2007, 2005 and 2001. In total, at the moment, Clos Saint Michel produce 4 red wines and 1 white wine from Chateauneuf du Pape as well as wine from Cotes du Rhone. Clos Saint Michel Tradition is made from 40% Grenache, 30% Syrah and 30% Mourvedre. The terroir is pure rocks and stones. The vines are planted in the les Coulets vineyard. The wine is aged for 12 months in vats. Close to 3,500 cases are produced each vintage. Clos Saint Michel Cuvee Reserve is from vines more than 50 years of age. The blend is usually 40% Grenache, 30% Syrah and 30% Mourvedre. The terroir is pure rocks and stones. The vines are planted in the les Coulets lieu-dit. The wine is aged in used French oak barrels for up to 24 months, depending on the character and quality of the vintage. Clos Saint Michel Homage To Heritage is the newest addition to their portfolio. The wine, which is made from a Grenache heavy blend, is meant for early drinking. The first produced was produced from 2013 vintage. Clos Saint Michel Grand Clos Grand Reserve is produced using only 100%, old vine Mourvedre. The wine is aged in a good portion of new, French oak barrels. Not much of this beauty is produced. On average, slightly more than 800 cases are made in a good vintage. The wine is not produced every year. In fact, it has not been made since 2004. Clos Saint Michel Chateauneuf du Pape Blanc is a blend of 30% Grenache Blanc, 30% Clairette, 20% Roussanne and 20% Bourboulenc. The wine is aged in a combination of stainless tanks and French oak barrels. Clos Saint Michel can be enjoyed young with decanting of about 1 – 2 hours, give or take. This allows the wine to soften and open its perfume. Older vintages might need very little decanting, just enough to remove the sediment. Clos Saint Michel is usually better with 3-5 years of bottle age. Of course that can vary slightly, depending on the vintage. In the best vintages the wine should be consumed within 8-20 years after the vintage. Clos Saint Michel is best served at 15.5 degrees Celsius, 60 degrees Fahrenheit. The cool, almost cellar temperature gives the wine more freshness and lift. Clos Saint Michel is best served with all types of classic meat dishes, veal, pork, beef, lamb, duck, game, roast chicken, roasted, braised, stewed dishes, sausage, barbecue and cassoulet. Clos Saint Michel is also good with Asian dishes, hearty fish courses like tuna, mushrooms pasta, eggplant, tomatoes and cheese. The white wine of Clos Saint Michel is best served with a myriad of different seafood dishes, shellfish, crab, lobster, sushi, sashimi, chicken, pork and veal, as well as Asian cuisine. It is impossible not to see, taste and feel the richness, depth, sweetness and purity of the fruit here. Lush in texture, long and with depth of flavor, give this some time in the cellar to further round out, soften and add more nuance. The wine is a blend of 40% Grenache, 30% Mourvedre and 30% Syrah. Deep in color and fruit, the wine is round, supple and fresh, The tannins have a hint of salt, the fruit comes with added nuances of black cherries, thyme and pepper with a backing note of smoke. The wine is a blend of 40% Grenache, 30% Mourvedre and 30% Syrah. Spicy, with a layer of black raspberry, dark cherry, licorice and plum, the wine has real weight, density, spice and length. Plush and fat, the fruit sticks to your palate, and that's a good thing! The wine is a blend of 40% Grenache, 30% Mourvedre and 30% Syrah. There is depth of flavor, loads of sweet, ripe, dark cherries, thyme and a smoky character here. Round and supple, with ample fruit in the finish, this is quite nice. The wine is a blend of 40% Grenache, 30% Mourvedre and 30% Syrah. Spicy, black raspberry and pepper, with a forward, medium bodied, open, peppery, black raspberry quality in the soft, and spicy finish. The wine was produced from a 40% Grenache, 30% Syrah and 30% Mourvedre. Black cherry and thyme in the nose, with silky tannins and a forward, kirsch filled finish. The wine was made using a blend of 40% Grenache, 30% Syrah and 30% Mourvedre. Silky and lush, with loads of sweet ripe, earthy, chocolate covered cherries, the wine is plush and polished. The wine was made from a blend of 40% Grenache, 30% Mourvedre and 30% Syrah. Soft red fruits, medium bodied, forward and approachable. Silky, soft, spicy red fruits, earth and pepper start things off before your hit with a blast of spicy red cherries with hints of bright strawberries in the finish. Powerful, decadent, rich, fat and intense, the wine is palate coating with its layers of sweet, fleshy, jammy berries and intensity. Fat, juicy, black raspberries, licorice, garrigue and lush textures are found in this open, forward wine. Delicious, sweet, ripe, lush, juicy fruits, round textures and a lusty finish.